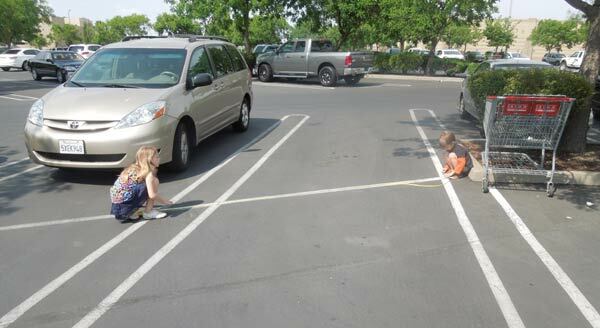 The first bad news came in the Disneyland offsite parking lot, labelled the "Toy Story" lot. 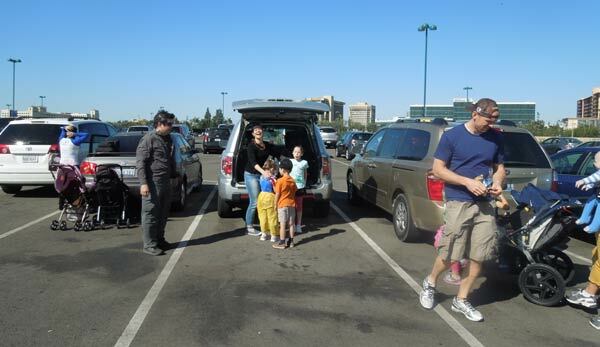 We piled into the Honda Pilot and drove one mile from our rental house to Disneyland where we paid $15 to park. The lot had just opened for the day, and hundreds of cars were arriving at the same time as ours. We were waved into a spot next to two other family cars. I stopped the car and started to open my door when the wind grabbed hard, pulling it open. I caught it. "WHOA!" I announced "The wind is really blowing everybody! Kids! Don't open the doors!" I slid out of my door and let Christina and Kevin out of the rear lift door. BAM! The door of the Toyota van on our right slammed into our car's passenger side. A father jumped out and started apologizing immediately. 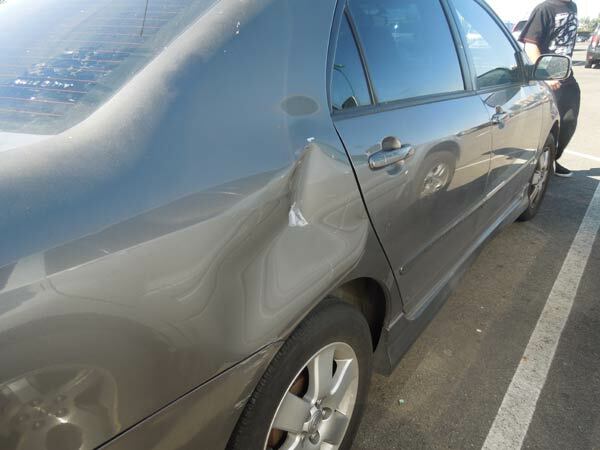 The wind had caught his door, and it had left a small dent in our car's rear fender. I started to get his insurance information when we heard another one. BAM! One of the kids had opened the door and the wind had caught it, slamming our door into the Totota Sedan on our left! His car was ruined! Look at that dent! From the wind! What could be worse? Arriving to Disneyland, you have so much effort and money invested in the trip, you just pull into the parking lot early in the morning, first thing and you have two car accidents. Dammit! Luckily, everyone involved had a cool head and everyone had insurance coverage. We exchanged information and tried to forget about it. Kevin put it best: This is a problem which will have to be dealt with on another day. An hour later, I was in Disneyland and the dents were the last thing on my mind. 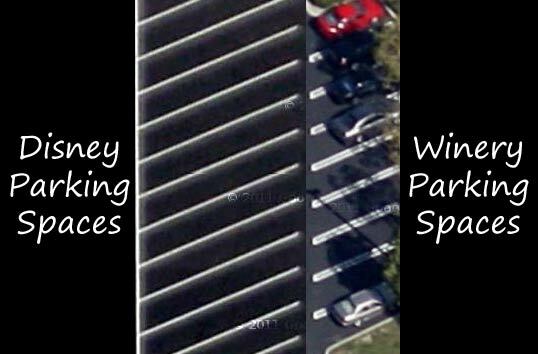 Besides strong winds, did tight parking spaces contribute to the accidents? I didn't get a lane measurement while we were there, but I could get an idea with the help of Google maps. I got a screen shot of our "Toy Story" lot, and the lot of a nearby winery. Both of these images were from the same magnification level. As you can see, the Disneyland spots are a bit thinner. Undoubtedly they were designed to squeeze in the most cars per acre. I went out Wednesday night with the last shuttles and measured a space. I measured the whole spot including one line. The spaces are slanted and I was concerned I might get the angle wrong so I measured across the top of the space where there's another line. I measured across that line. I had another person hold down one end and dragged it as taut as I could. Imagine my surprise when it snapped off before making it to the end. I brought with me a container of dental floss that said it had fifty yards of floss. I did not consider that it was not a new container and had only 103 inches of floss inside. It seems like I just bought this last year. So there I was, 8 PM... one more shuttle going back which I was going to need... I had to improvise. I measured the length of the floss, holding it taut. Then I had the other person mark that spot with her finger and dragged it the floss to the edge of the space and cut it. I photographed this and can send you the pictures if you like. This called up the depths of my high school geometry but I figured it would work. I was basically creating two segments. Segment 1 was from the outside edge of one painted line to a point called A. Segment 2 was from point A to the inside edge of the other painted line. Then we hopped on the last shuttle and went back. Worth noting, a Disney "Cast Member" watched us from the shuttle stop this whole time and never asked what we were up to. When I got back home I just had to figure the total length of both pieces of floss, then add in the measurement of Segment 2 again. I got the total length of both pieces as 103 and 1/8 inches. The smaller segment was 19 1/8 inches. That gives me a total width of 122 1/4 inches or 10' 2 1/4". I must admit there is plenty of room for error to creep in here. Dental floss is very stretchy and I believe I had it completely taut for both measurements. I also am not sure if the relative difference in humidity or temperature could have changed the length of the floss. I guess it comes down to the level of precision you are looking for. I wouldn't launch a rocket based on these calculations. We got back to Phoenix, opened the glove compartment and there was a tape measure sitting there. We all laughed and laughed. So, Disneyland spots are 122", Costco 138½" and Joanne's are 148". 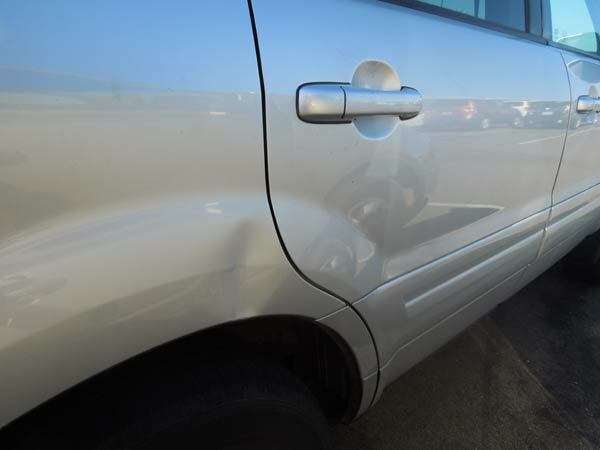 The spots at Disneyland are thin, but did that increase the damage the doors inflicted? No, the thin spaces probably didn't increase the damage. Faced with a constant force of the wind, being close to our neighbor probably helped keep the final impact speed low. However, being in snug spots limits the amount of time an exiting passenger would have to react when he sensed strong wind grabbing the door. In any case, next time we park at Disneyland, we are taking the DeLorean.